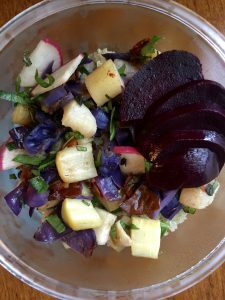 This recipe is delicious for lunch or dinner and is the perfect way to use up the ends of the veggies from the farmer’s market or your CSA box! Place the beets in a closed casserole dish or wrap in foil and bake in oven. They are done when they are easy to poke with a fork. Toss olive oil and a dash of salt with cabbage, turnip and bell pepper (any roast-able veg will do, aim for about 4-5 cups of veg. Some good options would be sweet potato, radish, carrots, cauliflower, brussel sprouts, you get the idea!). Spread onto a baking sheet and bake beside the beets in the oven. Check veg around 20 mins and turn over. Put quinoa on to cook with 2 cups of water. Bring to a boil, then simmer for about 10 mins. Without lifting the lid, remove from heat and let it sit 10 mins. Remove veggies from the oven when they are fork tender, let cool slightly and chop into bite sized pieces. Remove beets when they are cooked, let cool slightly and the peel should slip off with a bit of finger pressure. Peel beets and slice. To serve, place quinoa in a bowl, top with roasted veggies, radish, fresh basil and green onion. Garnish with roasted beets. « Do you really need to read pregnancy books?